Prime Minister Tony Abbott says he will not rule out using military force in Iraq if the situation worsens. The Australian government signals its open to possibly using military force in Iraq should the situation continue to deteriorate in the Persian Gulf country. In an interview with Sky News following his meeting with President Obama on Thursday, Prime Minister Tony Abbott was asked under what circumstances would he consider committing Australia militarily in Iraq as part of a larger U.S.-led effort. “Look, I want to do what we reasonably can to protect Australian citizens, Australian interests and Australian values and there is a very strong community of interest and values between the United States and Australia and our other principle allies. So without ruling anything in, obviously this is a very concerning situation and it does need to be taken seriously and dealt with appropriately,” Abbott said. “Look, I don’t. I hope it doesn’t come to that of course, but this is a serious situation and it does need to be dealt with,” Abbott responded. Abbott was less committal in a different interview on Thursday when he was asked whether Australia would stand ready should the U.S. decide to use military force in Iraq. “I think it’s very early days to be talking about that but this is a very serious situation, no one should take it lightly. The last thing anyone should want is to see a large swathe of Iraq – or indeed any country – under the control of al-Qaeda type operatives. That’s the last thing anyone should want,” the prime minister said, according to a transcript of the interview released by Abbott’s office. Earlier, on Wednesday, Australia Defense Minister David Johnston had been asked by Reuters about the situation in Iraq while he was attending the 2+2 meeting with his Japanese counterpart in Tokyo. “I think the United States is very concerned, as is Australia, we’ll see how this plays out in the short term, and obviously we’ll talk to our friends and allies about how we can assist the legitimate government of Iraq. But, you know, they’ve got to ask for our assistance,” Johnston had said. However on Thursday Johnston told reporters that there were no plans in place for intervening militarily in Iraq at that time, something out-of-step with the comments of the prime minister only hours later. The Australian military deployed alongside the U.S. in both Iraq and Afghanistan after the 9/11 terrorist attacks. 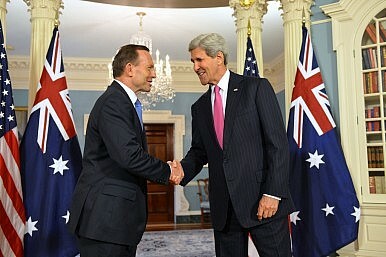 As my colleague Shannon noted today, in his meeting with Abbott at the White House on Thursday President Barack Obama had praised Australia as a dependable ally including in military cooperation. ”Aussies know how to fight, and I like having them in a foxhole if we’re in trouble,” the U.S. president said at one point. Canberra has a special interest in the situation in Iraq where militants of the Islamic State of Iraq and Syria (ISIS) have seized major Iraqi cities in the northern and western Sunni regions of the country. That’s because an especially large number of Australians have traveled to Syria to fight alongside the opposition in that country, of which ISIS is a major component. Indeed, during a trip to Washington back in April, Australian Attorney General George Brandis said: “I am sorry to have to tell you that per capita, Australia is one of the largest sources of foreign war fighters to the Syrian conflict from countries outside the region.” While noting that many Australians in the past had traveled to places like Pakistan and Somalia to fight alongside militants, Brandis said Syria was different because of the greater number of Australians involved and the fact that some of them were taking leadership positions. Prime Ministers Shinzo Abe and Tony Abbott will sign an agreement to open up cooperation on producing submarines. Coast Guards of India and Japan Conclude Naval ExerciseJapan’s Largest Company Is ISIS’ Car Maker of ChoiceCould Science Defeat Terrorism? Using Robots to Hunt Down ISISChina: A Solution in the Middle East?ISIS Is Destroying Priceless Artifacts. Here's How to Stop Them.